Welcome to Day 5 of Ice Cream Week 2014! This year the event is hosted by Kim of Cravings of a Lunatic and Susan of The Girl in the Little Red Kitchen. We have teamed up with 25 amazing bloggers to share some amazing ice cream recipes with you. I hope you belong to a gym. We'll all need it by the end of the week! Wow. The 5th day in a row I've posted a recipe, much less an out-of-my-blogging-comfort-zone ice cream recipe. If you've been making and eating along with our merry band all week, you probably need a new wardrobe. Like me. Except I've gotten serious about ramping up the mileage for the half marathon I'll be walking in 4 weeks, so I say . . . Bring It On! One of the awesome things about all this walking is the opportunity to let my mind wander and think up recipes. After I got the idea for Cinnamon Chunk Ice Cream [but before I got around to making it], I was walking while pondering what I could do with such a spicy ice cream. I didn't want to overshadow the cinnamon flavor, but I kinda wanted to have another #IceCreamWeek post. BOOM! [An idea, not a bus, hit me.] Use the cinnamon ice cream as the filling for an ice cream sandwich! And what better cookie to use than Snickerdoodles? See, walking is good for the mind, the body, and the blog. While I have tasted each recipe I've made so far, I've also given much of the ice cream away. To me, this is the best of both worlds--I get to make and eat a variety of tasty ice cream treats, and I save money not needing a new wardrobe. These ice cream sandwiches, for example, went straight to my son's marching band camp. I helped out feeding lunches during the camp and realized that band kids are like locusts. A tray of these ice cream cookie sandwiches vanished in under 3 minutes--and that was with the adults politely getting first crack at them! I made these Snickerdoodle Cinnamon Ice Cream Sandwiches in 2 sizes. I used my standard cookie scoop* for both the cookies and the ice cream which makes a 2-3 bite sandwich (and about 18 sandwiches per batch). Using half a scoop of each (cookie dough and ice cream) makes about 3 dozen bite-sized ice cream sandwiches. What's missing? The Cinnamon Chunk Ice Cream, of course! Oh, and butter too. You will need a mixer, an oven, and a freezer for this recipe. I like to mix up my cookie dough (and my pizza dough) a day ahead because I don't do kitchen marathons, only USAF (Half) Marathons, so I won't start off asking you to preheat the oven. In a large bowl (I use my mixer), have a minion cream the butter and sugar while you measure out the dry ingredients (baking soda through flour). 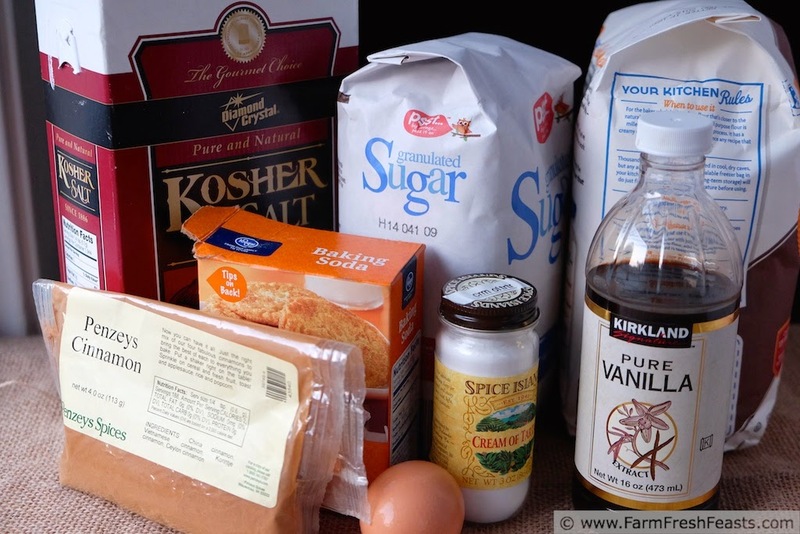 Once the minion has added the egg and vanilla and mixed them thoroughly, dump the dry ingredients in mix until well-blended. Chill for several hours or overnight. When you're ready to bake, preheat the oven to 375 degrees Fahrenheit. Mix up the cinnamon sugar for rolling in a small bowl [bonus points if it's pretty]. 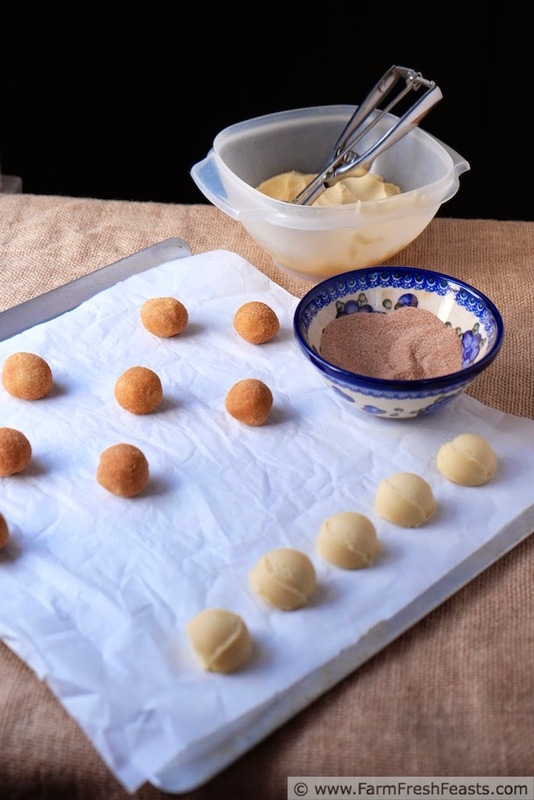 Scoop* cookie dough into the amount you prefer (bite sized or large), roll into a ball, toss with cinnamon sugar, and place on an ungreased or parchment-lined cookie sheet. Bake for 9 (small) to 11 (large) minutes, then cool in the pan 2 minutes and remove to a rack to finish cooling. When you're ready to assemble the ice cream sandwiches, use the same amount of ice cream as you did cookie dough. 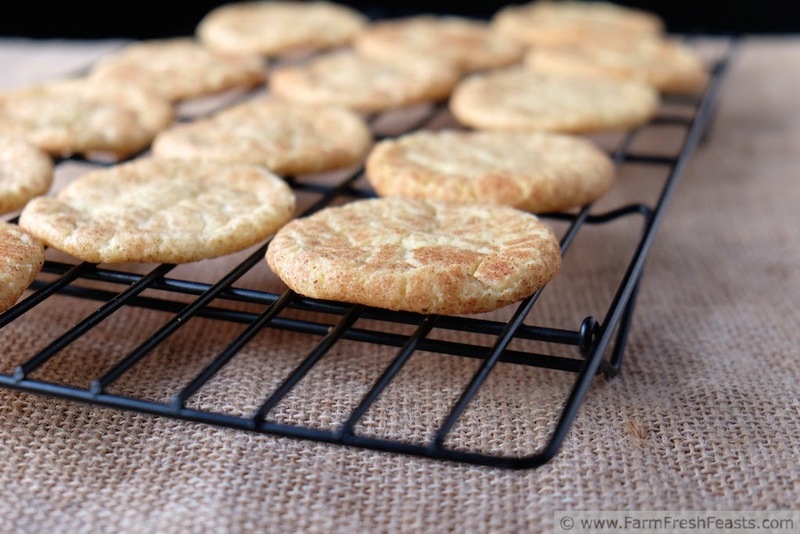 Flip one cookie bottom up, add slightly softened ice cream, and press another cookie right side up on top. Return to the freezer to harden (I use a metal tray) before serving. I assume these would keep, wrapped, in the freezer a few days, but I have no experience with that! *My cookie scoop holds ½ ounce by volume (1 Tablespoon). I am now craving ice cream for breakfast! Love this! If it came with a side of brownies, I could eat ice cream for breakfast too. 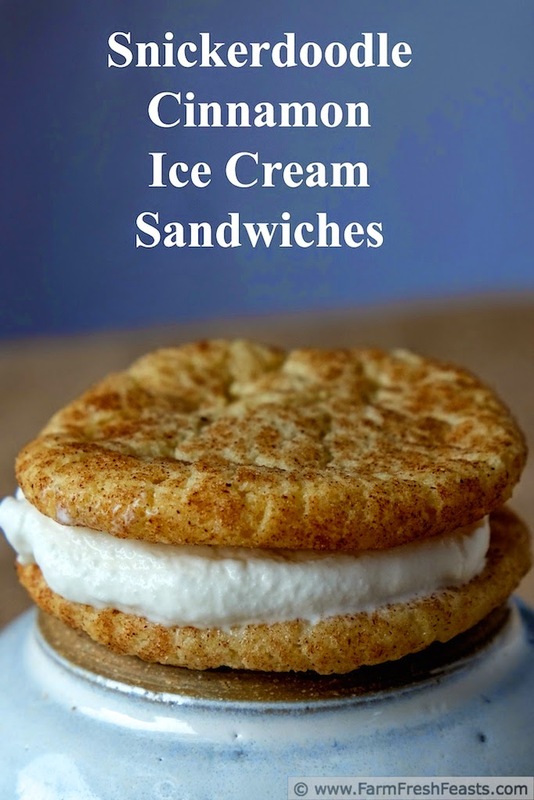 I'm drooling over these ice cream sandwiches! The marching band kids were as well--for a second, until they inhaled the whole tray! These sandwiches were pretty tasty. Thanks! Hi! I saw this in From the Farm blog hop. 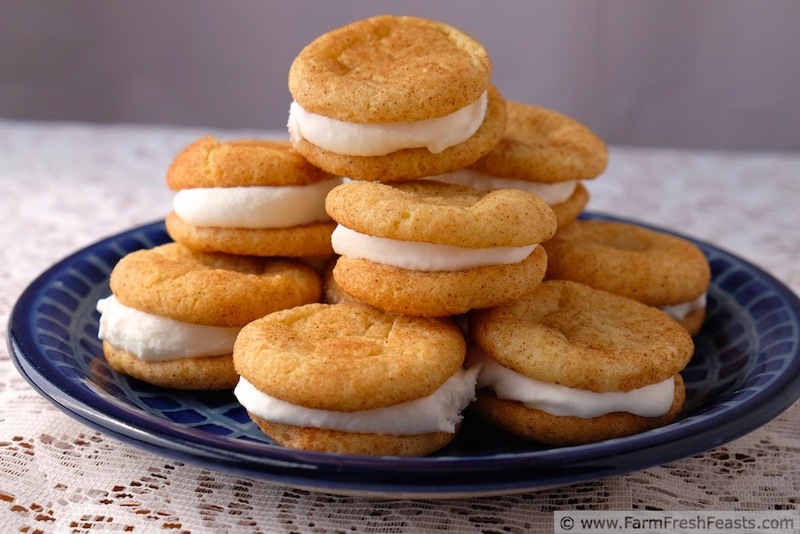 Great idea for cinnamon chunk ice cream between a couple of snickerdoodles. I am pinning this to my Ice Cream Bars and Sandwiches board. If you are interested, homemade ice cream is one of my specialties. I have lots of original recipes on my blog, and some great ice cream pinterest boards. Wish I had known about this group featuring ice cream recipes for a week. Thanks for sharing this! Your loved ones are very lucky that homemade ice cream is one of your specialties! All I do is make things with beets, which is not so exciting to the kids OR the spouse. Stopping by from the From the Farm blog hop. This looks delicious ... thanks for sharing! It's pretty cool when you can see an idea through to completion. I absolutely love these. Now I need a minion to help in the kitchen. Oscar might be up to the task minus the whole missing opposable thumbs bit. You need to keep on walking if it inspires recipes like these. The thumbs and the excessive body hair/fur really put a damper on having our critters be our minions, you know? I have 3 dogs. I walk. A lot. Oh my gosh I absolutely must have these! Get some cream of tartar and get going! You CAN have these, too! These ice cream sandwiches are so tiny and cute. I love the cinnamon ice cream. Tiny sandwiches are easy to eat--though I don't know if that means I'd eat more or not! Luckily the band kids ate them first. Good article and recipe, They look amazing i have to try these with some of our spices. Thank you! I bet your spices would make them delicious!